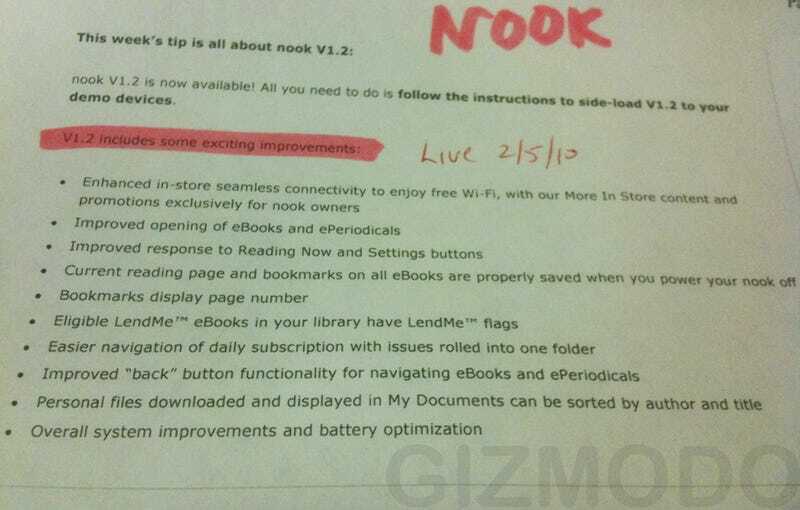 Internal Memo Shows Nook Firmware Update 1.2 Will Hit "This Week"
• Overall system improvements and battery optimization. We're also told that the touchscreen fades in and out now (rather than flashing on and off), plus it "feels snappier." Each of the bullet point updates is fairly vague, as words like "improved" are tough to gauge until actually seeing them implemented. But in terms of making the Nook generally more pleasant to use, firmware 1.2 looks like it's stepping in the right direction. Something as simple as being able to power down the system without losing one's page is definitely a biggie, and battery optimization, well, that's always welcome. UPDATE: We've already received word from a reader who has installed the update, so it looks like B&N is widely releasing the firmware as of now. She says that "pages load noticeably faster, and the touchscreen seems more responsive. There's also some redesign of the UI, although the cover flow feature is about the same." And maybe most importantly, the LCD-based buttons are rounded now.